Beta versions here of work in progress and ideas that are being tested out. If you have a few minutes to spare, give them a try and help to improve Sailwave by giving some feedback. You can download Version 2.12.2 from the link below. Note this is an exe only. You can download Version 2.12.1 from the link below. Note this is an exe only. Ability to Join First and Last Names at import – No preprocessing required. You have 3 options – Typically you would only select one of them. Helmname if this is ticked then if there is already a competitor with this name then the one in the csv will be ignored. 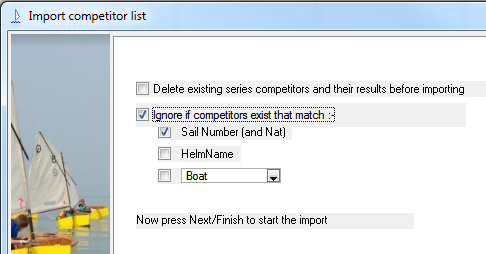 There is then a custom selection where you can select any field – you could use Boat to stop entries being duplicated – or if you are importing from an online entry system this may create a unique entry number. This way you can run the import regularly as new entries are received. Click Finish and they are visible in the main area. This version can also join the First and Last names for the Helm and Crew and put them into a single field. Note when this option is selected you cannot match on Helmname. These will HELMFIRSTNAME and HELMLASTNAME are concatenated with a space between them into HelmName – If you want you can map them in reverse you then get the Last Name first. The same is applicable to CREW. You can download Version 2.11.1 from the link below. Note this is an exe only. This version is based on Version 2.11.0 with the following fixes notified by Mark. You can download Version 2.11.0 from the link below. Note this is an exe only. This version is based on Version 2.9.7 with the following changes. When scoring all competitors as one group and sorting by field after scoring each group, is now published as a separate table rather than all inline within a single table. 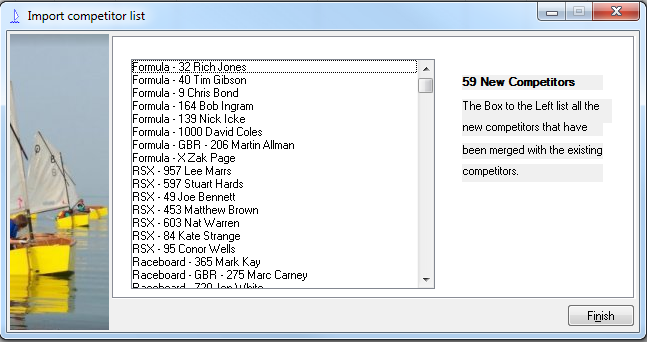 You can also order the individual tables and selectively publish them as when you score groups of competitors separately. It also contains new messaging functions for use with the Team 15 or other interfaces. You can download Version 2.9.4 from the link below. Note this is a full install. This version is based on Version 2.9.3 with the following changes. You can download Version 2.9.3 from the link below. Note this is a full install. You can download Version 2.8.4 from the link below. Note this is a full install. As Promised a few screen shots.